In World War II, spies came in all forms. Michael Curtiz directs Humphrey Bogart as the owner of a bar in Africa who just wants to get away from it all. An old flame, Ingrid Bergman, drops in and involves him more in the war than he would like. This 1942 movie pits love against loyalty. 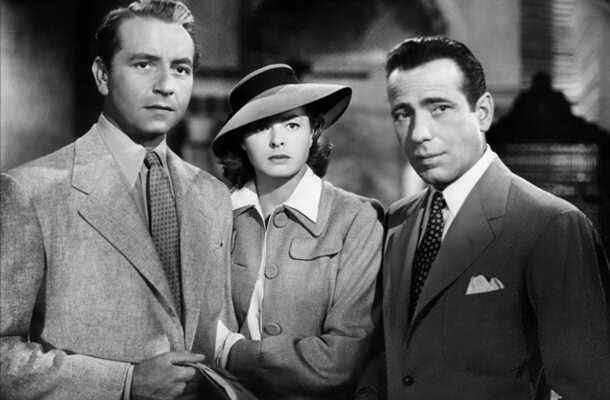 “Casablanca” regularly places very highly on lists of the greatest films of all time. It is traditionally in the top ten on many American Film Institute lists alongside other classics like “The Godfather,” “Citizen Kane” and many other notable films. As a love story, “Casablanca” is like no other and its characters will stay with you long after you finish the film. You’ll understand entirely why Bogart and Bergman are revered the world over for their fine quality artistry. The film is also important as an example of the era; such films that are story and character driven are powerful reminders that the best films don’t require expensive stunts or record-breaking budgets to be world class works of cinematic art. This is a great film to watch with a significant other, so make some popcorn and prepare to be riveted to the screen.